Ryan heard about MyGaps when Cheryl, Clacton-on-Sea's Centre Manager came along to his school to talk about the programme. When Holly finished at her local school she wasn’t sure what to do. She was interested in the project because she needed somewhere to go. She didn’t want to be sitting at home doing nothing, which is exactly what she would have been doing. Before Aliyah started on MyGaps in Cambridge, she was attending the local college, but found the large mixed age class sizes quite difficult to deal with. She also used to fall asleep in class as she suffers from Narcolepsy and Cataplexy and finds it difficult to explain to people about her condition. All these difficulties meant that she lost her motivation and started missing more and more classes. Jade didn’t get much of an education as she was taken out of school and never had the opportunity to return. She managed to start training as a hairdresser at the local college but realised that it wasn’t working for her at that time. The college told her about MyGaps and so she enrolled. She is really enjoying the course, studying English, maths and Level 1 customer services. She likes the way things are taught and all the support and coaching she is receiving on the course. Keenan found himself in a difficult situation. The school where he was in sixth form was closing and he was not able to apply for another sixth form as it was too late in the year. He was keen to continue his studies, so when he heard about the Gaps programme he decided to enrol. 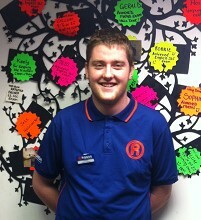 Keenan had plans, he was keen to start an Apprenticeship and wanted to improve his maths and English to do this. At Gaps he got a lot of support from the tutors and found that the small class sizes really helped him. Our Cambs Gaps learners handed over a cheque for £303 to the East Anglia Children’s Hospice. The money was raised with support from Circuit where they developed handmade gifts which they sold at their “Pop-Up-Shop” in Cambridge earlier this year. Hi, I’m Brian and I’m from Bedfordshire. I am going to tell you about how I became NEET and how TCHC helped me get through it. My mother had died five years earlier and was still recovering from the grief of her death. I had been living with my grandparents who had been doing their best to support me, but I was finding life really hard. I turned my back on education because I found it really useless but started to feel like I was wasting my life. Hi, I’m Sarah, and I am from Norfolk. I found myself lost and lacking in confidence and the motivation to work. I had not been getting on well with my parents and started to spend more and more time at my boyfriend’s house. At this point I was referred onto the Youth Contract, a government-funded project supporting 16 and 17 year olds in the East of England. Hi, I’m Samantha and I am NEET. This means that I am Not in Employment, Education or Training. I had previously been living with my mother but unfortunately we never had the best relationship. When it soured, I couldn’t take it any more so I decided to leave and move in with my partner’s parents. I was being bullied by five girls in the same village. They would call me names and push me about when they saw me. I was scared to leave the house because I didn’t want to bump into them. My confidence plummeted, as I stopped going out and having fun. Eventually, this meant that I also stopped going to school, and as a result I became NEET (Not in Employment, Education or Training). Hi, I’m Liam, I’m from Norfolk, and I have always suffered from a severe lack of confidence. My teachers did not help me enough with this at school, and a result I did very badly and ended up dropping out. My life started slipping away, at least until I found out about the Youth Contract, a mentoring and advisory project. My girlfriend told me about it and I thought it was something which would help me get my life back on track. Thank you for reading this blog about myself. I’m hoping to explain to you and everyone else who chooses to read this, how I became N.E.E.T and how my life is now getting back on track. I will be splitting this into different entries. Thanks once again and read on!